I’m a pretty big Monty Python fan. I wanted to share this because as a member of a writer’s group, I found insight in Eric’s experience of writing with others. Now, I realize that Eric Idle was writing comedy sketches to be performed with other members of the Monty Python troupe, but the process of writing in the same room as someone else is the same. My own writer’s group, the Weaklings, is made up of very different types of writers. I write flash fiction and YA fantasy and I work best in public settings while listening to music. My friend Bob writes epic fantasy tomes and can seemingly write anywhere with anything going on. Andrew writes in silence and preferably in seclusion. And Matt writes poetry, which is as far from my understanding as writing upside-down while wearing a pink tutu (I don’t actually know Matt’s process that well, so maybe he does this). During the 3-day Novel Contest, however, we all write together in the same room. When we write communally, there is a synergy of ideas, a free-flowing exchange of new perspectives that brings out the best in our work. When I get stuck in my manuscript, I shout out the problem to the world at large and my writing friends shout ideas back to me. When they write themselves into a corner, they shout out and I shout back. Those of us who need music use headphones. And when our eyes begin to melt from staring at the screen for too long, we stop and eat together, encouraging each other along the way. I say all that to say this: a good writer’s group has been vital to my experience as a writer. There are some folks out there who say that writing is a solitary journey of hardship, but I don’t think that’s entirely accurate. Sure, when you are putting pen to paper, it is your hands following the instructions from your brain and you have the ultimate freedom to make your story do what you want it to, but there is value in sharing the experience. If I am allowed to give a little advice, write with someone else this week. Maybe you’ll be frustrated by how they plan out every little detail before figuring out the larger story. Maybe you’ll both have such a good time together you won’t get any writing done. Maybe you’ll write in silence and question why you invited the person along in the first place. And maybe you’ll find someone who you can bounce ideas off and it will make your writing come alive. Since I started thinking about my college days again for last week’s post, I thought I’d share another college story. When I first moved to Kalamazoo in order to attend Western Michigan University, music was something that was still primarily enjoyed by listening to the radio (that makes me feel very old all of the sudden). Illegal file sharing was yet to be made illegal, and the iPod was only a glimmer in Steve Jobs’ eye. 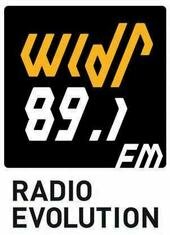 While searching the dial for a station worth listening to, I stumbled across my college’s radio station, WIDR, and instantly fell in love. I still get nostalgic for WIDR and many’s the time when I wish that I could get the signal where I live now. All of the DJs were students, long awkward pauses and dead air were not uncommon, and I had never heard of most of the musicians they played, but it all worked. WIDR had the perfect mix of loveable amateurism and exposure to the underground music scene. But enough of my gushing and on to the story. I learned where the station was located after being invited to speak about the Valhalla Norwegian Society, of which I was president at the time. As it happened, WIDR’s studio was located in the same building as the registered student organization mailboxes, so in the weeks following the interview, I would stop in at random to say hi to the DJs who interviewed me with whom I had struck up a friendship. On one such visit, rather than ask if my DJ friends were available, I stepped up to the main desk and said, “I’m here to pick up my prize pack.” Now, there was no prize pack waiting for me, but I thought that on the off chance that I could get a free t-shirt or something, I’d try my luck. “Then, why did you come in?” asked the receptionist, and rightfully so. I waited. True to her word, this mystery musician put my name down for two tickets to her show that night. This turn of events gave me sufficient reason to ask out a girl that I’d been interested in a for a few weeks. What a great first date story that would be, I thought (isn’t it funny how we want to make our lives fit into clever story arcs?). To my surprise, the girl agreed and off we went. I raised my hand. People from all directions stared at me… and my date. I should probably say that the girl that I brought to this event was a shy girl who didn’t like the spotlight. I looked over at my date. She gave me a thumbs up, but the look on her face was not happy. “Cool,” she said, and then she finished her show. The first date became the last date, and that was okay. Nothing ventured, nothing gained and all that. It just wasn’t meant to be. Afterward, I stopped back into the radio station to thank them for doing the interview with the musician that led to me getting free show tickets. My DJ friends invited me to talk about the evening on the air. I told them that it was a good evening, but that things didn’t work out. That was when they decided that it would be a fun show segment to have girls call in to the station and go on dates with me (WIDR would be footing the bill) and then I would talk about my experiences the next day. At the time, I thought nothing of being pimped out by my college radio station and thought it would be a fun way to see concerts and such for free. The promotion never came together however, and now I’m really glad that it didn’t. 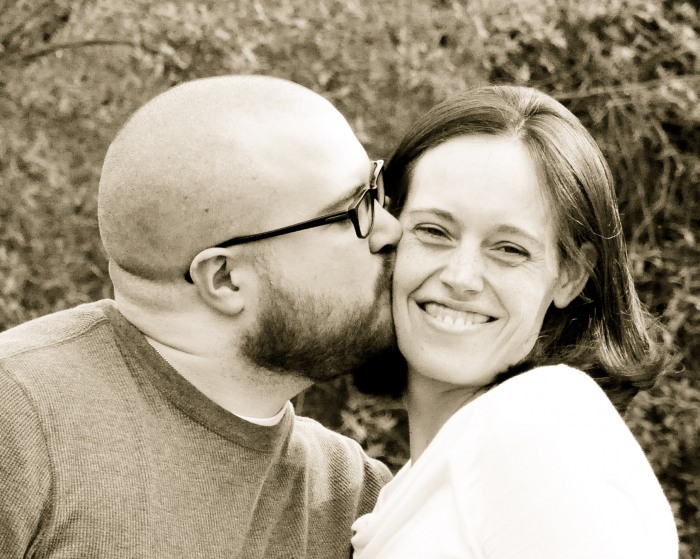 Now, I’m married to a wonderful woman (a bit on the shy side, I guess I have a type). And though I’m sure that my wife would never have left me when confronted with a spotlight on us, I’m glad that our story started differently. I wrote this back in 2008 after my grandpa died. He was a serviceman in the US Navy during WWII. In the spirit of Memorial Day, I wanted to share this and remember him and his service, both to our country and to his family. God bless you Norman Mosey. My grandpa always used to read the obituary section. He said that if he didn’t see his name there, he knew that he wasn’t dead. It was one of his little jokes. He was full of little jokes. When I would ask for a half glass of orange juice, he would ask which half I wanted filled. “The top half,” I would reply, at which time he would fill my glass full. I always complained that I only wanted a half glass. It took me about twenty years to figure out that in order to fill the top half, the bottom half had to be filled first. It didn’t take much to amuse him. 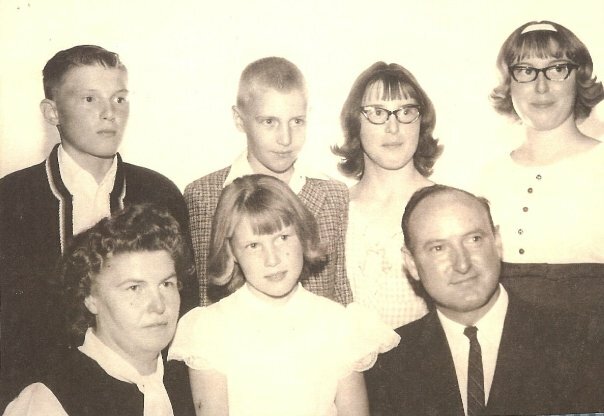 I spent a week with my grandparents during one summer vacation when I was eleven or twelve. I discovered that they didn’t do much, or at least, they didn’t do much of what I thought was fun at the time. But the week was not without its entertainment. Without speaking a word, my grandpa invented a little game while lounging in the sun in his armchair. Sun filtered in through the window and was reflected by his watch onto various surfaces in the living room. I soon noticed that the reflected light was deliberately moving from item to item. From where I sat, I too could reflect the sunlight, and so our nameless game was born. It was a simple game of chasing his reflection around the room. It was possibly the most fun I had that week. I guess it doesn’t take much to amuse me either. I heard the story once of how my grandparents met. 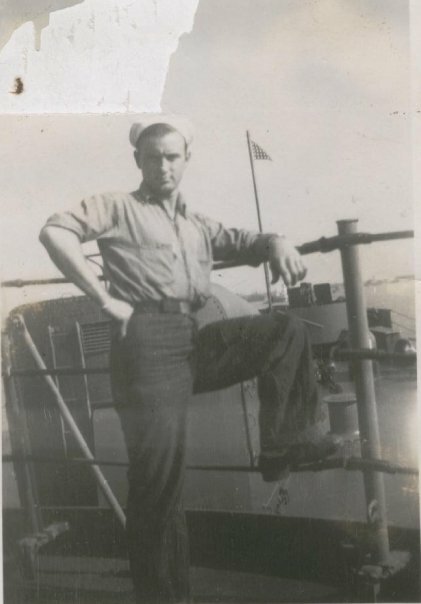 My grandpa was in the Navy. My grandmother and her sister took part in a morale-boosting program that wrote letters to servicemen. It was my grandmother’s sister who wrote to grandfather. What they said to each other, I’ll never know, but when my grandpa expressed a desire to meet, my shy grandmother’s sister sent my grandma in her stead. And the rest was history. They had five children; two boys and three girls. He wasn’t a man who said what he felt. By the time I met him, my grandpa only had nine and one third fingers. For the longest time, I assumed that the missing two-thirds of his tenth digit were victims of the Second World War. I asked him once if this was the case and he confirmed it. A few years back, I found out the truth. He had accidentally pinched his finger in the door of a car and it was safer to amputate than deal with infection. 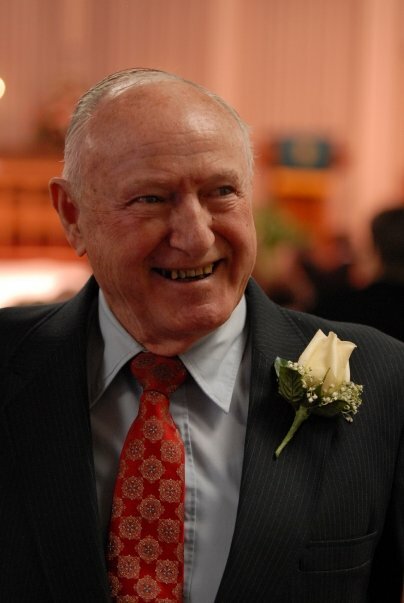 My grandpa wasn’t always honest, but he was always good for a smile. He died today as he was clearing the snow from his driveway atop his tractor, “Big Johnny.” The tractor was in the road when a car came around the corner and cut the tractor in two and my grandpa into more pieces. The other driver walked away. 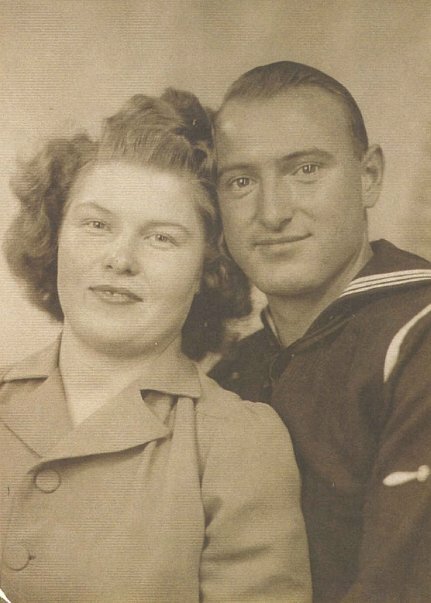 My grandparents were two days away from their sixty-second anniversary. I guess my grandpa never changed his mind about loving my grandma. We won’t be able to play simple games anymore, or lie to each other about the scars that we bear. And soon his obituary will be in the newspaper and he won’t be there to read it. Maybe that means that he’s not really dead. My new British friend Vikki of The View Outside and I are swapping blogs for the day. It’s a great way for my readers to get to know some other great bloggers out there, and vice versa. So when you are finished reading her post here, pop over to her blog to see my post. Be sure to look around at her other posts while you are there! There are a few things in life I’m passionate about. I come from a long line of “helpers”; it’s something that’s in my blood. My grandfather started the first Community Centre (helping disadvantaged young people) in London just after World War II. So when I stumbled across The Insecure Writers Support Group, it was inevitable that it would appeal to me and I jumped at the chance to join. 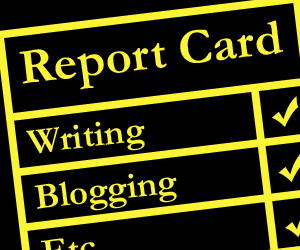 The founder, a sci-fi writer, Alex J. Cavanaugh, currently has 280 bloggers signed up to the group, from BlogSpot, WordPress and other blog hosting sites. Although I’ve only been a member for 2 months, The Insecure Writers Support Group feels like my online writing family. A place where I can face my fears, admit them to others, and more importantly, to myself. I’ve had some great advice and support from some lovely Bloggers. I don’t profess to be an expert on writing (far from it), but what i can do is offer my support and reassurance and hope that i make someone feel that they’re not alone. The preface for today’s review goes like this: I didn’t think I would enjoy a book that deals heavily in the fairy realm… I was wrong. Here’s the plot summary: When Mom and Dad win a cruise, Kendra and Seth Sorenson go off to stay with their grandparents. Little do they know that their grandparents are the caretakers of a magical preserve for mythical creatures. And when Seth decides to break some of the rules, the whole family is in danger. With enemies like wily witches and powerful demons, Kendra and Seth find help from a couple of rule-breaking satyrs and the Fairy Queen herself. I don’t want to go to into detail here because it is a great read, and I would hate to spoil any of the twists that the author so skillfully weaves in. That said, here are a few things that the author does well that we could all learn from. Character Dichotomy – Kendra is definitely the protagonist, as we see the majority of the story through her eyes, but her brother Seth is the one who really moves the plot along, so I consider them both to be main characters. The great thing about having two main characters is that you can draw from their differences to enrich the story. Kendra is the quiet reflective one who follows orders well. Seth is her polar opposite. Either way, readers will have someone with whom they can identify. Making It Worse – I sometimes feel bad for my own characters when I take them from one bad situation and place them in a worse one, but as long as we have characters that people care about, it is a great way to draw readers into our story and increase tension. Mull does a great job of both creating characters that we care about, as well as making them do things that make us cringe. I found myself often cursing Seth as I read because of the bad decisions that he made, but in the process, I was really saying that I care about these characters enough to want everything to turn out well in the end. Parenting Tips – It’s kind of funny that in a story where the parent’s are absent (though not dead or completely out of the picture), real life parents would be able to pull so much out of the story in order to teach their kids. Many of the characters lend to teaching moments for parents who are reading this book with their kids (or teacher with their students). Things like, “Do you think it was a good idea for Seth to go off the path after his grandfather told him not to? What happened as a result?” Stuff like that. Illustrations – I realize that this isn’t the author’s doing specifically, but kudos to the publisher (Aladdin – an imprint of Simon & Schuster) for including some excellent graphic illustrations in the book. They are one of the perks of the novel that have nothing to do with the story, but everything to do with the reading experience. If you are a writer, check out this link for Brandon Mull’s advice to writers (young and otherwise). 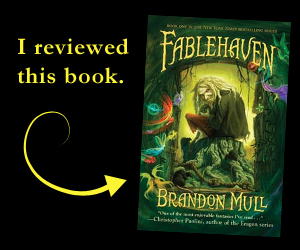 And whether you are a writer or not, pick up a copy of Fablehaven. Universities can do strange things to people. Some people drink and party. Some people study hard and become successful and rich. I started a registered student organization devoted to watching Viking movies. When choosing a dorm for my freshman year at Western Michigan University, I went in blind. Some people say that it is safer to be roommates with someone you know, but I didn’t want to end up hating someone that I knew from high school. I was assigned to live with a group of sophomores in the Honors College dorm, Eldredge Hall. As it happened, one of those sophomores was from my hometown anyway, though I had not seen him in many years because he went to a Catholic high school.In addition to having our hometown in common, we had a common heritage of being part Norwegian (a very small part if I am honest). For some reason, we bonded over this fact and the Valhalla Norwegian Society (VNS) was born. This film is officially endorsed by the Valhalla Norwegian Society. At first, the VNS existed solely to watch movies about Vikings. 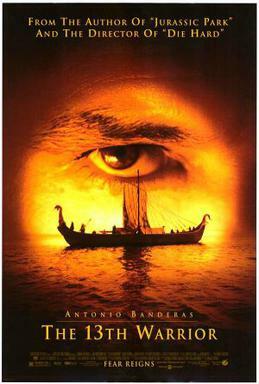 We watched The Longships and The 13th Warrior and then The Longships again. While watching, we would drink ginger beer (the closest thing to mead we had at the time) and say things like “By the Hammer of Thor, this ginger beer is delicious,” and “By Great Odin’s Ravens, I love this film!” And then I decided that we needed to evolve as a group and become recognized by the University. Because that is where the money is. I discovered that if a student group is registered with the University, that group can apply for funds from the student government for things like scholarships and events. All that was needed was for the VNS to come up with a constitution and to have a President and a Vice President. Thus, we wrote a constitution and I became the president and my roommate the Vice President. We got a mailbox in the student government offices and were featured in the student newspaper and on the student radio station. It wasn’t long before we had tripled our membership (to six) and were holding joint events with other registered student organizations. Lego asked me to model for this minifigure. It was fun for a semester, but as these things do, it fizzled around exam time. The following year, we didn’t bother re-registering because we didn’t have time to fill out the necessary paperwork to apply for scholarships for ourselves. I’m not sure the student government would have allocated us the funds anyway. But for that one semester, it was real. And because it was real, I still list that I was the President of the Valhalla Norwegian Society on my CV. I am a Viking.